An OXFORDSHIRE CORRESPONDENT would be most welcome! (Please see our Folklife "﻿TEAM﻿" web page for details. As you may know, the Folk Weekend team are all volunteers, and having done seven festivals on the trot we’ve decided to have a fallow year in 2019, so that we can get some rest, regroup, and look at where we want to go in the future. If you’re interested in getting involved in the festival now is a great time to get in touch, and help shape the look of the festival from here on in! → GROVE, near Wantage, Oxfordshire. Various venues in Grove. ⊕ WHFF is a small, friendly, traditional festival where there is an emphasis on taking part. There is ample opportunity to sing, play or tell a story, with singarounds and music sessions throughout the weekend. A small number of guest performers will each host a workshop, or give an informal concert or special presentation as well as performing in the main concert on the Saturday evening. The festival also incorporates a day of dance featuring many dance-sides and culminating in a barn dance hosted by White Horse Ceilidhs. → BANBURY, Oxfordshire. Main concerts at Banbury Town Hall, other events at nearby pubs. 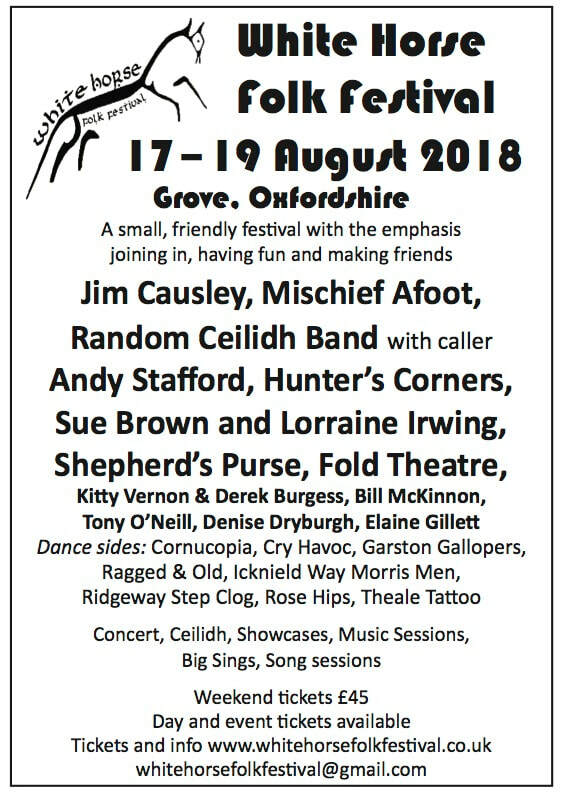 ⊕ The friendly indoor festival in the heart of Banbury! A low-cost festival with a great line up! On the 2nd week of October with a range of concerts, song and music sessions and dance. Headline acts tba. Main Concerts - Acoustic Concerts - Folk Club sessions - Big Sing - Song, Music & Storytelling Sessions - Workshops - Morris Dancing. No Oxon members for ➃ Services, but always glad to hear from enthusiasts who would like to join us !